The KidsFit 535 ABL Platform Steps is a sturdy solid wood frame is the perfect way for participants to practice walking up and down, & side to side while enchancing their physical development. 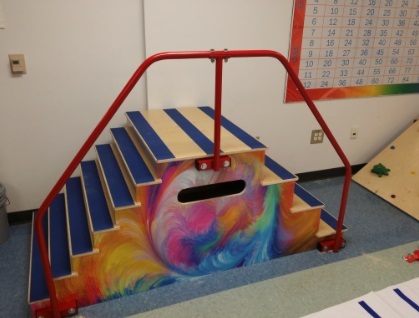 One side of the stairs offers 3 large platform steps for increased stride length, while the other side offers 6 smaller steps to challenge balance and spatial awareness. *This picture is shown with OPTIONAL handrails. Add an additonal $145.00 for the handrails. Call 1-800-875-9145 to speak with one of our fitness advisors about our Kids Fitness Equipment. Go to FitnessZone.com today to order your KidsFit 535 ABL Platform Steps. Order your KidsFit 535 ABL Platform Steps from FitnessZone.com today!